No one leaves. While he could have written tickets for anyone smoking the now-slightly-decriminalized cannabis, he instead exits the scene, never to return. 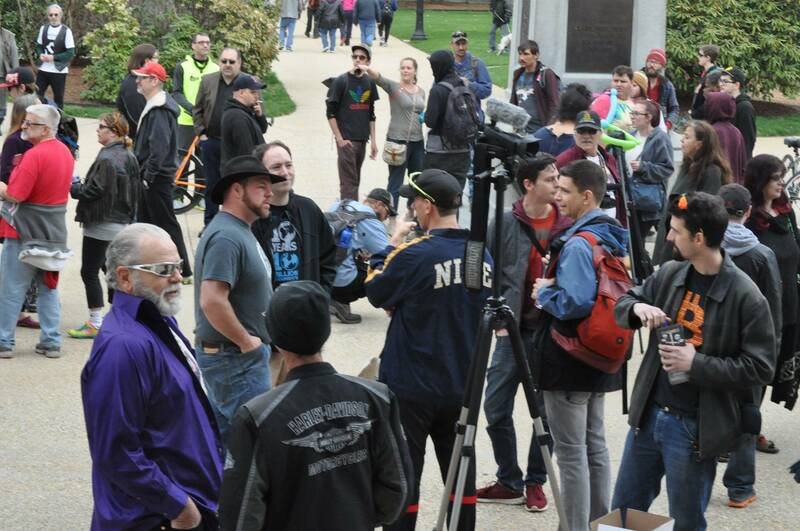 For those keeping track, this is the first time in nearly a decade of 4/20 rallies at the state house steps where any such intimidation was tried. 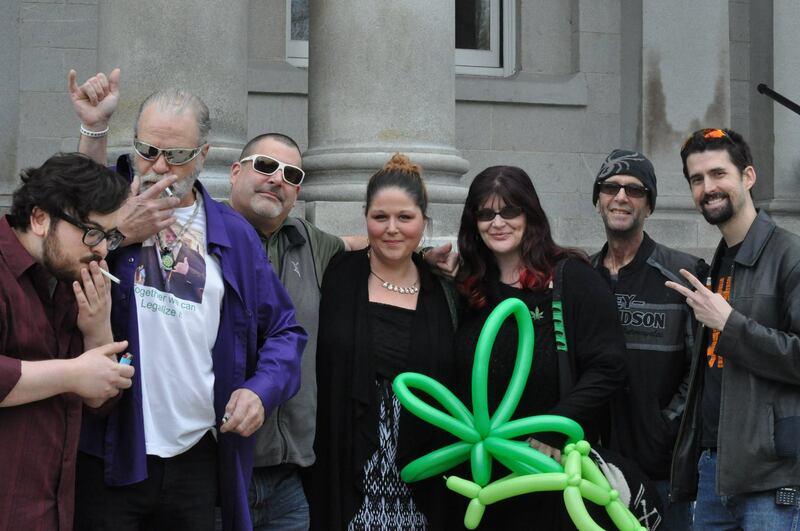 At previous rallies, all participants were risking misdemeanor possession charges, yet no one was ever arrested. This year was the first where decrim for under 3/4 oz has been in effect. Thanks to Garret Ean of Free Concord for capturing this on video. Will Coley, new mover to Keene and imam of the soon-to-open MALIC Center – Keene’s new mosque – recently made headlines over the city’s demand he obey them and ask permission to exercise his right to religion. Here’s the Union Leader story and the NHPR piece about the conflict. Apparently undeterred by their recent, unsurprising loss at the NH Supreme Court for their attempt to crush the free speech rights of the Robin Hooders for feeding expired parking meters, the City of Keene gang is now trying to crush the right to religion and free assembly. Will originally made the mistake of trying to ask the city gang’s blessing to install a sign. He should have known that asking for permission to exercise a right never ends well. The answer is almost always no, and fees and hoops galore are demanded by the bureaucrats. Unfortunately, despite telling the city gang that the sign was going up, after consulting with the local Muslims he is serving, they asked him to try to go through the city’s demands for the sign permission slip. So, the sign is not up. However, now that an inch has been given, the city gang is ready to take a mile of obedience, fees, meetings, and paperwork. In a letter addressed to Will by the city’s “Planning Director” Rhett Lamb, Lamb tells Will he’ll need a “change of use” for the building and an “certificate of occupancy” to gather in the structure, neither of which have anything to do with a sign. However, they have everything to do with submitting to a group of strangers who think they have a right to control your life and property. Last year I had the pleasure of attending and broadcasting my talk radio show, Free Talk Live, from the third annual NH Hempfest! This year it’s back, rebranded to the “NH Cannabis Freedom Festival“, again at the beautiful Roger’s Campground from August 25th-27th. Like last year’s event, this year promises to be packed full of wall-to-wall live musical performances by some great bands. (And this year they are accepting bitcoin – get your tickets here!) If you were wondering what this excellent festival was like last year, Free Keene blogger and radio host Robert Mathias was there and spent the last year of his life putting together a feature-length documentary about it! Set to the music of the live bands that were recorded professionally throughout the weekend and filled with gorgeous aerial shots of the vistas at Rogers Campground, the new NH Hempfest Documentary features plenty of footage giving you a taste of what it was like to be there in person. Mathias’ lovingly crafted, somewhat trippy feature film shows the beginnings of the festival from the setup day, through the weekend, including three full music videos recorded live from performers “Pigeons Playing Ping Pong”, “Zach Deputy”, and “Twiddle”. The documentary also keeps viewers up-to-date on the latest developments regarding cannabis decriminalization in New Hampshire, and does an excellent job portraying a solid anti-state, pro-liberty message to the cannabis crowd, a demographic ripe for the ideas of freedom. Kudos to Spirit Love Productions‘ Robert & Ann Mathias and Justin Campagnone for the stellar job putting this together. The NH Hempfest Documentary is the third feature-length documentary produced by people who’ve moved to New Hampshire as part of the NH Freedom Migration. Prior to this was 2014’s “101 Reasons Liberty Lives in New Hampshire” and 2012’s “Derrick J’s Victimless Crime Spree“. New Hampshire is the destination for freedom lovers from around the globe. Nowhere else has this solid level of media and activism coming out of it. Join us here, ASAP! Hope to see you at this year’s NH Cannabis Freedom Festival, August 25th-27th at Rogers Campground in the stunning White Mountains of Northern New Hampshire. Tickets and more info available here. 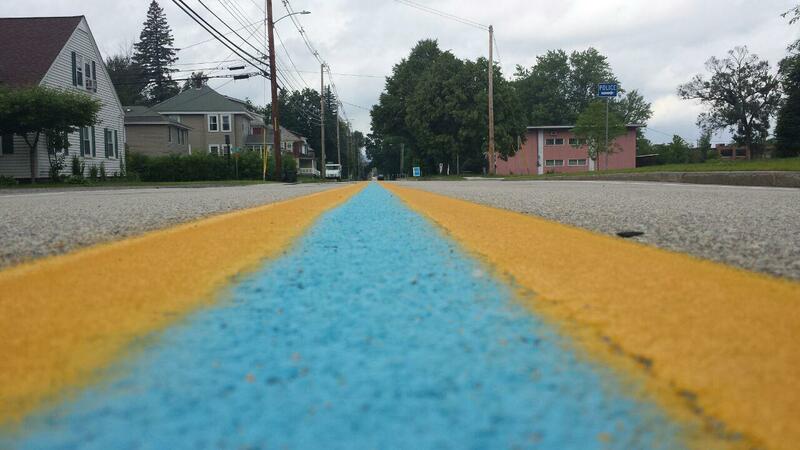 City Commits Civil Disobedience Against Feds By Painting Blue Line Down Marlboro St. In case you aren’t aware, the police have their own gang symbol. It’s called the “thin blue line” – a blue line horizontally sandwiched between two black bars. You’ll frequently see it on the back of vehicles presumably containing police or their immediate relatives. 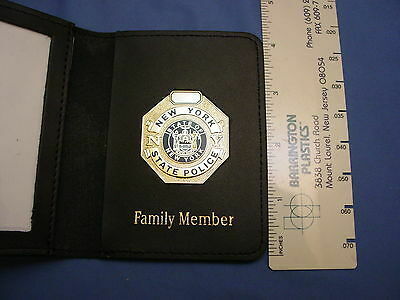 Of course, anyone can buy these stickers now, so police have other ways of recognizing their own, like these family “professional courtesy” passbooks, but regardless, the blue line is still seen on their cars, their clothing, and now flags. It helps create the “us vs them” mentality that some police have. Worse still, some people insist on treating the police as though they are better than the rest of humanity. Their word is gold in court, they get special burials when mass calamity happens, deferential treatment in many of the crimes the corrupt officers commit, and more.